Have the lightest and most efficient hachet on the market with Trail Blazer's 13 inch Hachet. Designed with a ergonomic handle to reduce wrist fatigue and various other repetitive stress injuries. 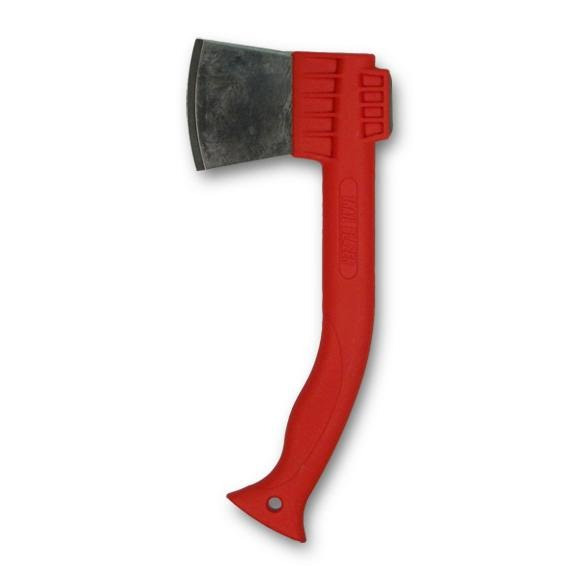 High Carbon Stainless Steel knife blade edge allows for longer edge retention and quicker cutting Reinforced Glass Fibered Nylon Handle Handle material provides a durable and lightweight hatchet. Have the lightest and most efficient hachet on the market with Trail Blazer &apos;s 13 inch Hachet. Designed with a ergonomic handle to reduce wrist fatigue and various other repetitive stress injuries. High Carbon Stainless Steel knife blade edge allows for longer edge retention and quicker cutting Reinforced Glass Fibered Nylon Handle Handle material provides a durable and lightweight hatchet. Heavy duty Condura Belt Sheath Belt sheath allows for quick access on your pack or on your belt. Worth the price. Good grab. Handy. Solid.Incredebly sharp. Very light.